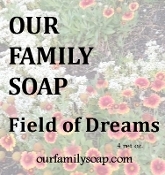 Our Basic Soap with the addition of a special EO/FO blend. A light delicate scent with an overtone of jasmine and wild rose. Like sitting in a field of flowers. Olive oil, coconut oil, lye (sodium hydroxide, necessary for soap making), EO/FO blend, coco butter and Vitamin E. Generous 4 oz bar.